It's a depressing time to be covering the consumer SSD market. Although performance is higher than it has ever been, we're still seeing far too many compatibility and reliability issues from all of the major players. Intel used to be our safe haven, but even the extra reliable Intel SSD 320 is plagued by a firmware bug that may crop up unexpectedly, limiting your drive's capacity to only 8MB. Then there are the infamous BSOD issues that affect SandForce SF-2281 drives like the OCZ Vertex 3 or the Corsair Force 3. 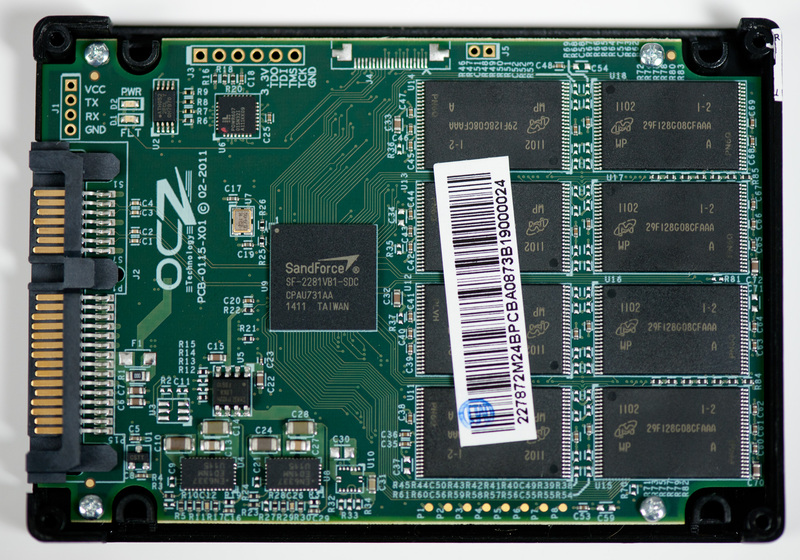 Despite OCZ and SandForce believing they were on to the root cause of the problem several weeks ago, there are still reports of issues. I've even been able to duplicate the issue internally. It's been three years since the introduction of the X25-M and SSD reliability is still an issue, but why? For the consumer market it ultimately boils down to margins. If you're a regular SSD maker then you don't make the NAND and you don't make the controller. A 120GB SF-2281 SSD uses 128GB of 25nm MLC NAND. The NAND market is volatile but a 64Gb 25nm NAND die will set you back somewhere from $10 - $20. If we assume the best case scenario that's $160 for the NAND alone. Add another $25 for the controller and you're up to $185 without the cost of the other components, the PCB, the chassis, packaging and vendor overhead. Let's figure another 15% for everything else needed for the drive bringing us up to $222. You can buy a 120GB SF-2281 drive in e-tail for $250, putting the gross profit on a single SF-2281 drive at $28 or 11%. Even if we assume I'm off in my calculations and the profit margin is 20%, that's still not a lot to work with. Things aren't that much easier for the bigger companies either. Intel has the luxury of (sometimes) making both the controller and the NAND. But the amount of NAND you need for a single 120GB drive is huge. Let's do the math. The largest 25nm MLC NAND die you can get is an 8GB capacity. A single 8GB 25nm IMFT die measure 167mm2. That's bigger than a dual-core Sandy Bridge die and 77% the size of a quad-core SNB. And that's just for 8GB. A 120GB drive needs sixteen of these die for a total area of 2672mm2. 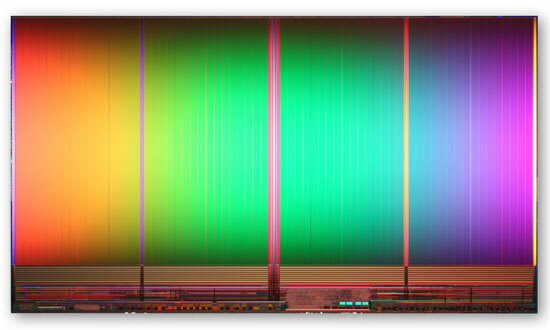 Now we're at over 12 times the wafer area of a single quad-core Sandy Bridge CPU. And that's just for a single 120GB drive. This 25nm NAND is built on 300mm wafers just like modern microprocessors giving us 70685mm2 of area per wafer. Assuming you can use every single square mm of the wafer (which you can't) that works out to be 26 120GB SSDs per 300mm wafer. Wafer costs are somewhere in four digit range - let's assume $3000. That's $115 worth of NAND for a drive that will sell for $230, and we're not including controller costs, the other components on the PCB, the PCB itself, the drive enclosure, shipping and profit margins. Intel, as an example, likes to maintain gross margins north of 60%. For its consumer SSD business to not be a drain on the bottom line, sacrifices have to be made. While Intel's SSD validation is believed to be the best in the industry, it's likely not as good as it could be as a result of pure economics. So mistakes are made and bugs slip through. I hate to say it but it's just not that attractive to be in the consumer SSD business. When these drives were selling for $600+ things were different, but it's not too surprising to see that we're still having issues today. What makes it even worse is that these issues are usually caught by end users. Intel's microprocessor division would never stand for the sort of track record its consumer SSD group has delivered in terms of show stopping bugs in the field, and Intel has one of the best track records in the industry! It's not all about money though. Experience plays a role here as well. If you look at the performance leaders in the SSD space, none of them had any prior experience in the HDD market. Three years ago I would've predicted that Intel, Seagate and Western Digital would be duking it out for control of the SSD market. That obviously didn't happen and as a result you have a lot of players that are still fairly new to this game. It wasn't too long ago that we were hearing about premature HDD failures due to firmware problems, I suspect it'll be a few more years before the current players get to where they need to be. Samsung may be one to watch here going forward as it has done very well in the OEM space. Apple had no issues adopting Samsung controllers, while it won't go anywhere near Marvell or SandForce at this point. Firstly, I'd state I always appreciated you bringing these issues to the front page to allow the consumer to see these issues in a public venue, while also berating manufacturers for selling us junk. Thank you, Anand. That being said; I fully understand that the new Sandforce chips allow SATA6 connectivity, and are thus the fastest possible drives on the market...yet I have to ask, is it worth it? I don't see you mentioning these issues with last gens drives like the aforementioned X25-m, or Sandforce v1. Any SSD sold today is plainly 'fast', and order of magnitudes faster then magnetic-based storage. Is the incremental upgrade (of microseconds at best?) really worth sacrificing the reliability associated with last generations drives? Can anyone shed some more light on the Intel 320 series firmware problem that Anand mentions? I've experienced it recently myself with my work machine's 300GB model resetting itself to an 8MB partition with all data lost. Not a huge problem (good backup scheme) but still annoying. At least Intel kindly replaced my drive with a new one fairly quickly. However, given I had already ordered a bunch more drives for the company (before the failure), I would like to see a firmware update that fixes this problem. I'm getting nervous that we're going to experience a bunch of failures.